Solliday & Meyer, Dentists, 117 1/2 Main St.
Hale and hearty at the advanced age of 70 years, and having driven his 50 horse-power Rambler runabout in the neighborhood of 1500 miles in twelve days, Col. A. Solliday of Watertown, Wis., drew up in front of the Park Hotel yesterday morning shortly before 11 o'clock, a little tired, but in good spirits. Col. Solliday was accompanied by Mr. E. C. Stapleton, who made the entire journey with him. For the past six or seven winters, Col. Solliday, who gains his title from his service as Lieutenant Colonel of the Second Wisconsin Volunteers during the Spanish American War, has been an annual visitor to Daytona, having previously made his trips by rail. Having a natural fondness for automobiles and being an enthusiastic member of the Milwaukee Automobile Association, he decided this season to make the trip in his car, even against the advice of friends who feared that he would not be able to stand the trip. Leaving Watertown on the first of November, Col. Solliday and Mr. Stapleton took the road to Chicago, where they remained for two days, looking over the famous Windy city. Leaving Chicago they encountered a driving rainstorm, and after traveling ninety-five miles through a veritable deluge, were forced to stop and seek shelter. Resuming their journey they next stopped at Indianapolis, where they spent one day and where they were forced to make 3 different attempts to get out of the neighborhood, finding as many roads impassable owing to repair work being done on them. From Indianapolis they proceeded to Louisville, thence down through Bowling Green, to Cave City, where they halted temporarily for the purpose of visiting the Mammoth Cave. Completing this visit, they came on down to Nashville, Tenn., where they visited The Hermitage, the famous home of Andrew Jackson, located about twelve miles northeast of Nashville, on the old Lebanon Pike. From this point they also visited the Confederate Home nearby, where Col. Solliday, who as a veteran of the Civil War, made many acquaintances among the heroes of the gray, and spent several hours dealing in reminiscences of that memorable conflict and fighting over its battles. Leaving Nashville they journeyed to Chattanooga, thence to Atlanta, where they spent a day looking over the Georgia capital, whose buildings and general atmosphere of thrift made a vivid impression on him. After his visit to Atlanta, Col. Solliday chose the route through Macon and Valdosta into Lake City, Fla., from which point they came on to Jacksonville. In Atlanta, Col. Solliday was advised to secure the services of a guide over the greater portion of his trip to this city but believing himself a pretty good pathfinder, refused to do so, and came to Jacksonville under his own guidance. Though the trip consumed about twelve days, Col. Solliday did very little traveling at night, averaging from 75 to 140 miles each day. Throughout the entire trip his car behaved wonderfully, coming all the distance without any trouble or accident other than a broken spring, caused by an extremely rough and rocky road which they encountered in the vicinity of Bowling Green, Ky. They found the roads in fairly good condition throughout their journey, though somewhat rocky in Kentucky and very sandy from Valdosta to Lake City. Col. Solliday was especially pleased with the condition in which he found the Georgia roads and the good work which is constantly being done on them. Col. Albert Solliday, a veteran of two wars and long time professional man of Watertown, where he was engaged in dentistry for many years, died in the family home on Church Street after a protracted illness caused by advancing years. Col. Solliday was born in Lehigh country, Pennsylvania, February 13, 1841. He was educated in Pennsylvania and Ohio, graduating from the high school at Circleville, Ohio, in 1861. When the Civil War broke out he enlisted in the 114th regiment, Ohio volunteer infantry, August 11, 1862. 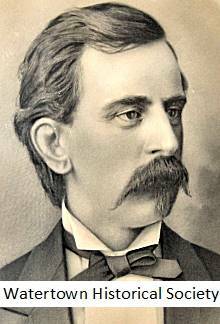 He was mustered out of service in July of 1865 and three years later came to Wisconsin and settled in Watertown where he engaged in his profession of dentistry, which he had practiced for a few years at Circleville. 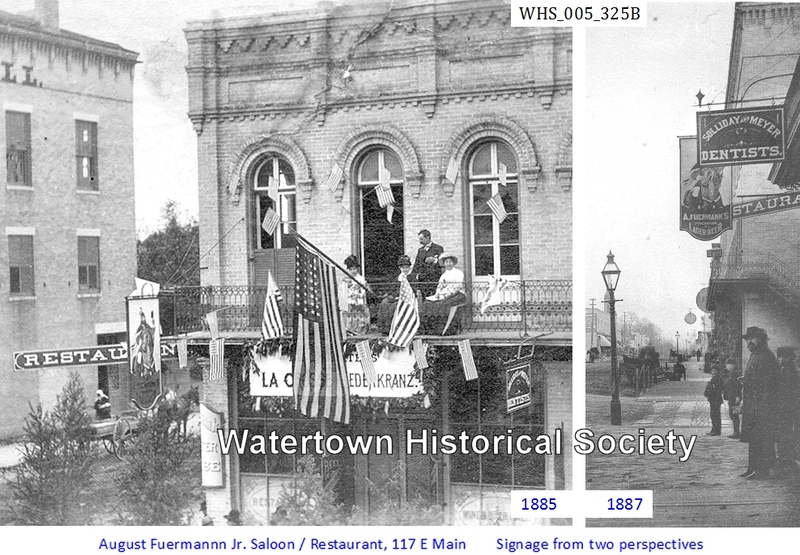 Upon his arrival in Watertown he opened dental parlors over the Bank of Watertown, where he remained three years, finally locating on Main Street (Solliday & Meyer, 117 Main) where he practiced his profession until his retirement from active duties. Col. Solliday held several positions of trust in Watertown, among them four years on the school board, part of the time its president; alderman of the Third ward and mayor of the city in 1884 and 1885. His services to the state were also many. In the Wisconsin National Guard he served six years as captain of the Watertown Rifles, 1882-88, and was then commissioned adjutant of the second regiment, W.N.G., April 25, 1888, major commanding first battalion, same regiment, February 23, 1892, and lieutenant colonel January 7, 1895. On January 2, 1899, he was appointed quartermaster general W.N.G., and January 5, 1899, received the commission with rank of brigadier general. He was a member of the Wisconsin National Guards for 27 years. For some years Col. Solliday was an officer of the Wisconsin National Bank and at the time of his death was president of that institution. In 1892 at a special election called to fill the vacancy caused by the death of the then State Senator Walter Green, he was elected and at the expiration of his term was re-elected to another full term. Spanish War Colonel's uniform accessories of Colonel A. F. Solliday. Col. Solliday was twice married. His first wife was Elizabeth A. Van Ness of Watertown, whom he married October 28, 1869. She preceded him to the grave in 1908. He was bereaved of his second wife a number of years ago, since which time he has been making his home with his son, Dr. A. F. Solliday. Col. Solliday was prominent in Masonic circles. He was a member of Watertown Lodge, No. 49, F. and A. M. Watertown Chapter No. 11, Olivet Commandery, No. 18. Knight Templers, and Wisconsin Consistory and Shrine, Milwaukee. He was also a member of Watertown Lodge No. 666, B.P.O.E. One son, Dr. A. F. Solliday of this city, and a brother, James Solliday of Grand Rapids, Michigan, are the only close surviving relatives beside two grandchildren, Miss Elizabeth Solliday and Albert L. Solliday. During his long and active life Colonel Solliday never failed to take an active interest in all that concerned the welfare of the community. He was one of the first city officials to attempt bettering the condition of city streets and succeeded admirably in the days before macadam or concrete were thought of. He believed that if a thing was worth doing it was worth doing well. He was a man greatly devoted to his home and friends and the latter were only measured by the scope of his acquaintances. In his death the city has lost a man of the type that is one of the best and not always fully recognized assets to a community. He was known as a man of sterling integrity, whose word was as good as his bond and whose character was above reproach. His funeral was held from his late residence on Church Street with service in the home under Masonic auspices and the interment was in the family vault in Oak Hill Cemetery. 02 18 Proposal to convert Washington Park into city athletic field. Strip of land is owned by the Col. A. Solliday estate. Albert L Solliday, son of Dr. A F Solliday, president of Pan American Petroleum Corp.
Susan S. Cady [1846–1900] resided with family of Col. A. Solliday after death of her father. Black leather case with safety razor set – a razor blade for each day of the week. Solliday estate. Kodak camera most likely belonging to A.F. Solliday.